The third chapter of Templar, Arizona, C. Spike Trotman’s webcomic magnum opus! 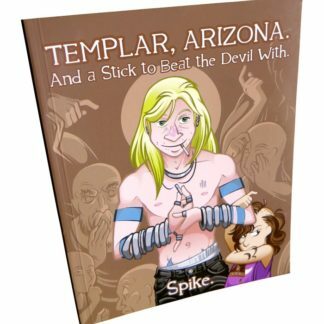 Templar, Arizona is the story of a city that doesn’t exist and the people who live there. It’s slice-of-life culture fiction in a slightly alternate history, starring a guy who’s trying to find himself while running away from himself. This dead tree incarnation of the third chapter, And a Stick to Beat the Devil With, features 128 pages of duotoned remastered art and extensive footnotes offering behind-the-scenes insight into the comic’s inspirations and influences.